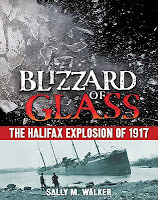 Blizzard of Glass: The Halifax Explosion of 1917 by Sally M. Walker. Grades 5-10. Henry Holt, November 2011. 145 pages. Review copy provided by my local library. It was 1917, smack in the middle of World War I, and many ships carrying war supplies went in and out of the harbor at Halifax, Nova Scotia. But the Mont-Blanc wasn't just any ship. Packed to the brim with explosives and combustibles, every sailor knew to take extreme precautions on board that ship. But accidents happen and when another ship collided with the Mont-Blanc in Halifax Harbor, it created the largest man-made explosion until the 1945 detonation of the atomic bomb. Halifax would never be the same. With riveting prose, Sally M. Walker presents a detailed account of the devastating Halifax Explosion and how it affected the people of Halifax. She starts by introducing the reader to a handful of families living in Halifax and how they started the morning of December 6, 1917, unsuspecting. The first few chapters give background information about Halifax and the ships and the war, each chapter ending with foreshadowing of the tragedy to come. When tragedy does strike, Ms. Walker's gripping account is hard to put down. Archival photos grace nearly every page, putting the reader right into the middle of the action. Buildings for 12 miles around were damaged and most of the buildings near the harbor were absolutely leveled. Luckily, a brave telegraph operator had been able to send out a final message alerting other towns to the disaster, so help was soon on its way. Confession: I am a huge fan of Sally Walker's books and I picked this one up on the strength of her name alone. It did not disappoint. 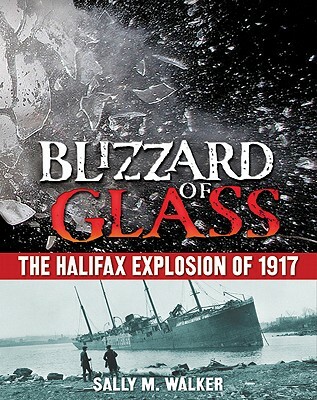 I knew nothing about the Halifax Explosion before picking up this book, but now I find myself wanting to press Blizzard of Glass into the hands of every young Titanic fanatic I know. This is surely just as exciting and tragic account as any about the Titanic. This is narrative nonfiction at its finest. And just as we've come to expect from Sally Walker, her excellent writing is paired with extensive research, making a truly fantastic nonfiction experience for young readers. The book includes extensive source notes, an author's note, a bibliography, and an index. I fully expect to see a shiny Sibert sticker on this one in a couple of weeks and I'll be devastated if it's overlooked for the ENYA shortlist next year. Promote this one to your Titanic fans as the anniversary approaches and hand it to anyone who likes thrilling disaster stories. Blizzard of Glass is on shelves now! Happy Nonfiction Monday! This week's roundup is over at The Nonfiction Detectives, so head over there and check it out!